There is a tongue-in-cheek joke amongst moto-journalists when it comes to new MV Agusta models: that each new machine is “the best motorcycle yet” from the Italian brand. The unspoken punchline of course is that each new model has such an incredibly low bar to surpass, that it is a relatively easy to be the next “best” motorcycle in the lineup, and thus it’s easy to lead a bike review with such a hyperbolic statement. That joke has been slowly fading away though, and it is becoming more of an honest reality, as MV Agusta’s motorcycle lineup has evolved from a family of luridly appealing motorcycles that unfortunately are also deeply flawed, to a brand of machine that can boast the competence to match its striking beauty. Nothing better proves this point than MV Agusta’s three-cylinder platform, which was mired by half-baked electronics and fueling at its debut in 2013, and now survives as a supersport/middleweight platform that should be on every rider’s short-list of must-ride motorcycles. 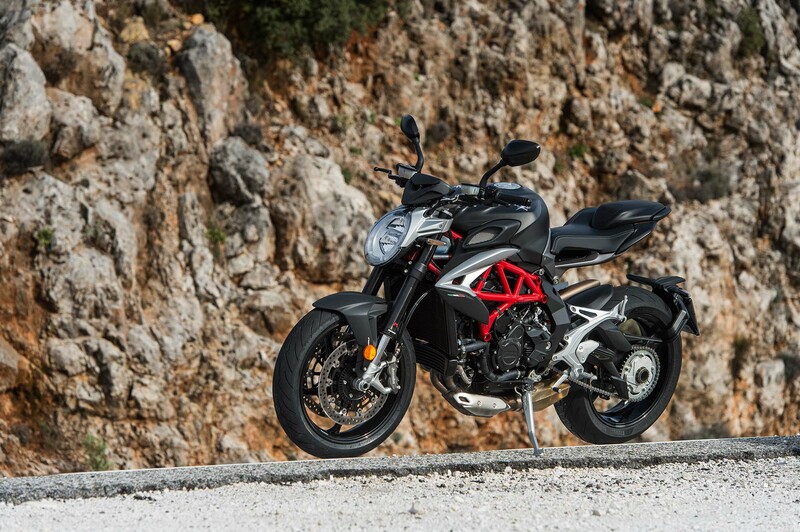 It is this trend that sees MV Agusta now updating its 800cc platform for 2016 (the 675cc machines will see an update soon enough), notably with Euro4 emission controls in full-effect. 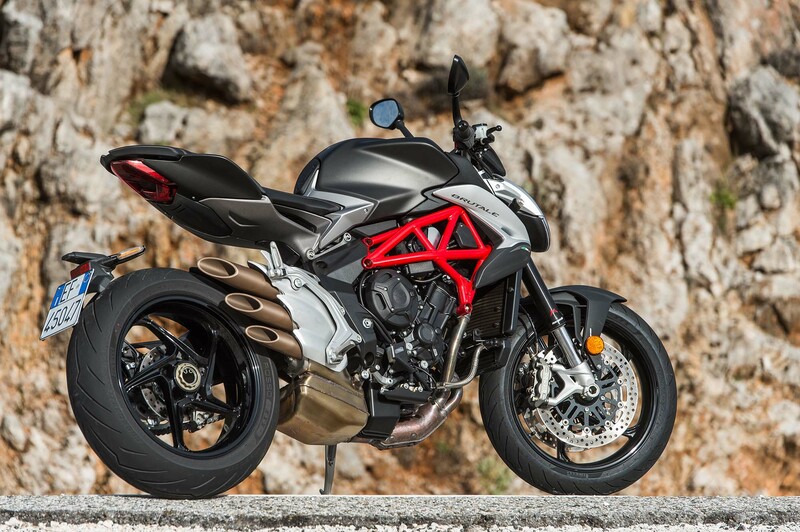 It seemed when MV Agusta debuted only a solitary machine at the 2015 EICMA show, the MV Agusta Brutale 800, with less power, more weight, and subtle design revision, that the Varese-based company had taken a step backwards from its forward progress. Now that we have had the opportunity to ride the machine in Málaga, Spain – we can see that is not the case. 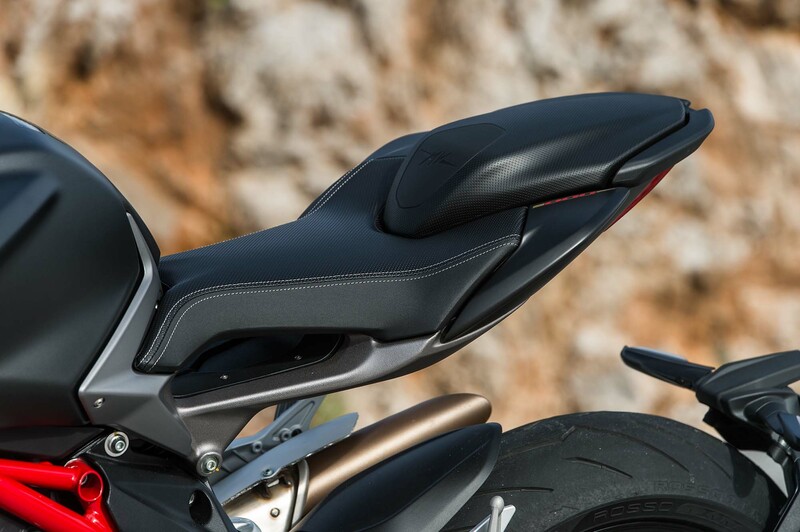 The new Brutale 800 signals an elevation of MV Agusta, from a brand with a shiny veneer and little beneath the surface, to a motorcycle company that can not only tug on the heartstrings of our moto-lust, but can also pique our more reasonable senses into seeing the substance beyond the glossy paint and subtle lines. 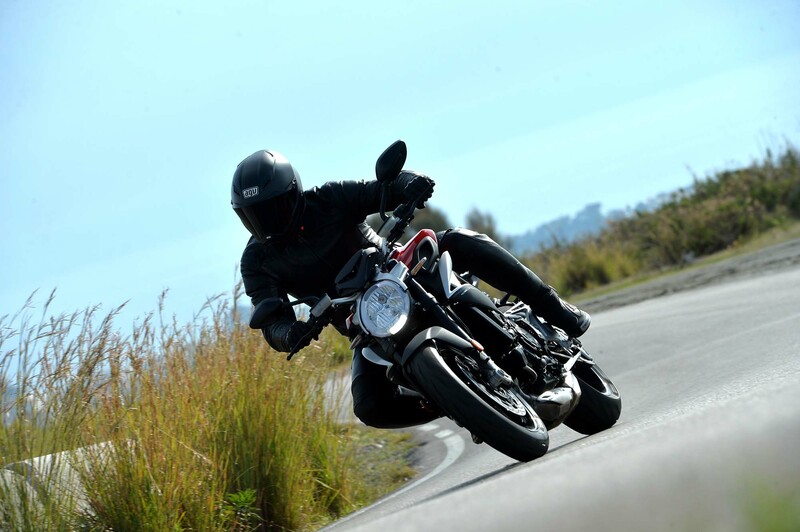 Quite simply put, the 2016 MV Agusta Brutale 800 is the best machine to come from Varese. 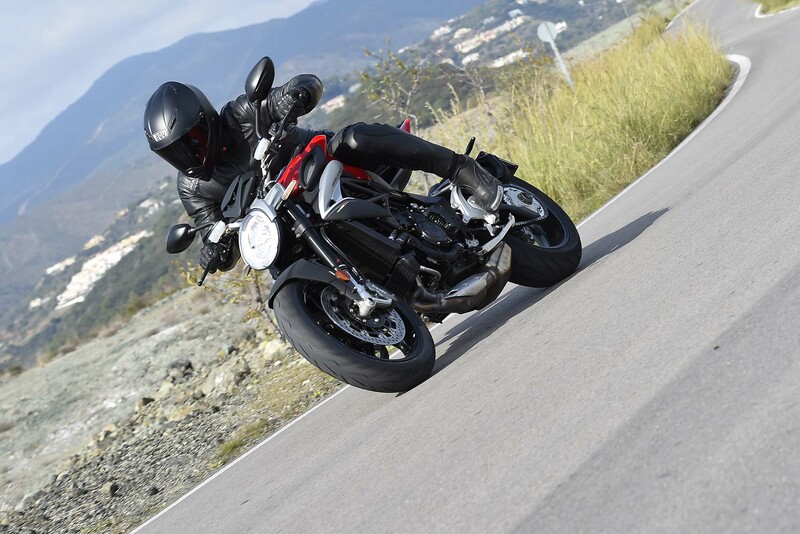 To make this assessment, MV Agusta brought us out to the Mediterranean Coast, to Málaga, Spain – just a short trip to the Strait of Gibraltar. A 150km out and back from Marbella to Ronda, our route took us via expressway through the city of Málaga, onto patchy city streets, and then finally into the mountainside that resides above the coast. 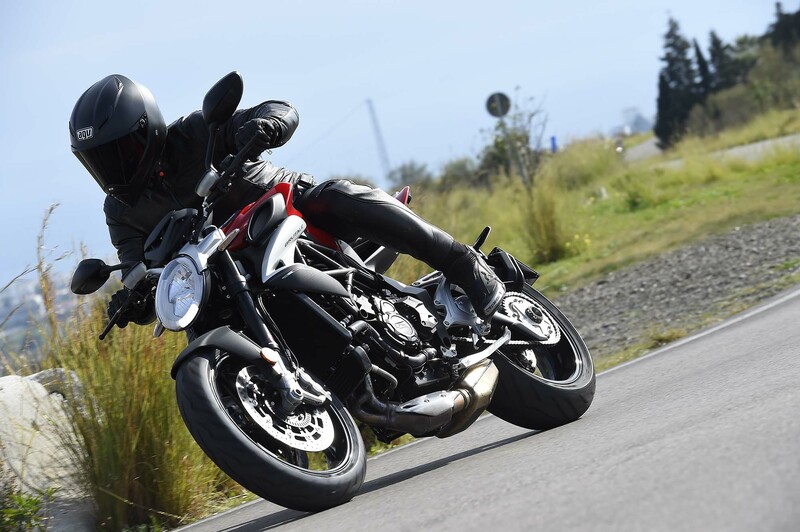 A perfect mixture of conditions, the route was well-suited to the typical riding one would do with the MV Agusta Brutale 800 – giving us a mix of urban use, along with a proper throttle thrashing on the fast mountain sweepers. Our ride was spirited and fast, perhaps too much so, as it gained too much attention from the Guardia Civil, and our antics were cut somewhat short. No worries officer, we’ll just get some lunch then. Much praise can be heaped upon MV Agusta’s 798cc three-cylinder engine platform. Virtually all the tuners we respect sing praises about the design of the triple, both for its power and its compact packaging. 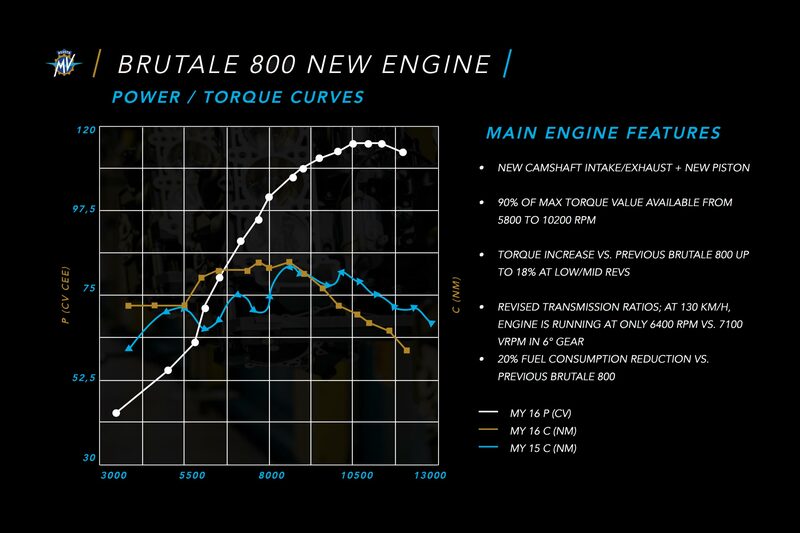 The 2016 version of the MV Agusta Brutale 800 makes a rated 116hp at the crankshaft, down 9hp from the 2015 model. 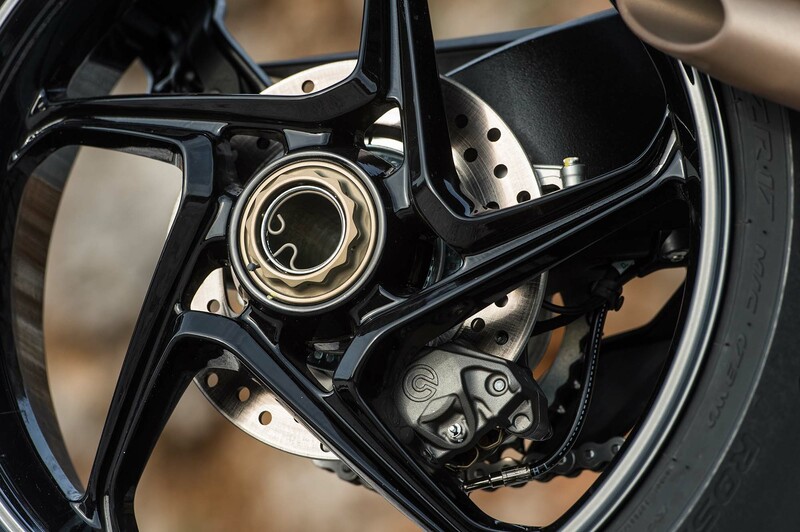 A fair loss in peak power, the tradeoff comes with MV Agusta adjusting the timing via the shape of the cam lobes, which as a result pulls the Brutale 800’s now flatter torque lower into the rev range. The result makes for bad spec-sheet racing, but bodes well for street riders, who spend far more time in the middle of the rev range than they do at the top-end. That’s not to say that we wouldn’t like to see more horsepower from the 798cc three-cylinder engine, as the new Brutale 800 lacks that extra punch we enjoy on larger displacement machines; but for a middleweight power plant, MV Agusta’s triple continues to shine. Power wheelies out of first and second are easy to achieve, and there is enough torque to ride spiritedly while keeping the bike in fourth gear, when you don’t want to work as hard for your two-wheeled enjoyment. As you would expect, the downside to MV Agusta’s tinkering with the valve timing is that it leaves the Brutale 800 with a less than “brutal” surge of power as you rev to redline. Instead, the affair is more blunted as your go north on the tachometer, with power building from revs, instead of mechanical torque. In the end, the trade-off is one that is well-made and practical. The 2016 MV Agusta Brutale 800 has great acceleration off the apex, thanks to its flat torque curve between 5,500 and 9,000 rpms, which easily exceeds any use that one would have outside of the race track. 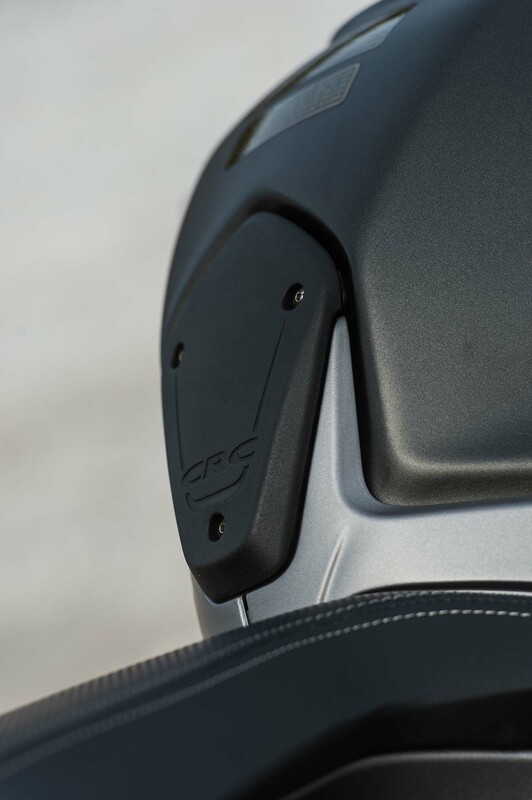 Supersport and superbike riders, who live their life at the top of the rev range, will have to adjust their riding style to suit, but any Brutale 800 owner who rides on city streets will see the immediate benefit, as they race from stoplight to stoplight. 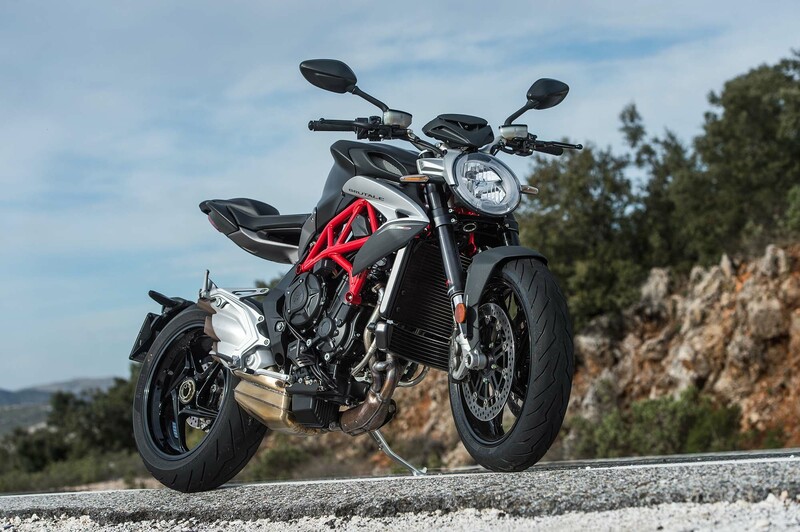 Fans of the previous Brutale 800 will miss some of the exhaust note’s loudness, with Euro4 standards tightly controlling now how much noise not only the exhaust can make, but also the motorcycle as a whole. A raspy tone is still there though though, and should sufficiently sooth more visceral riders. 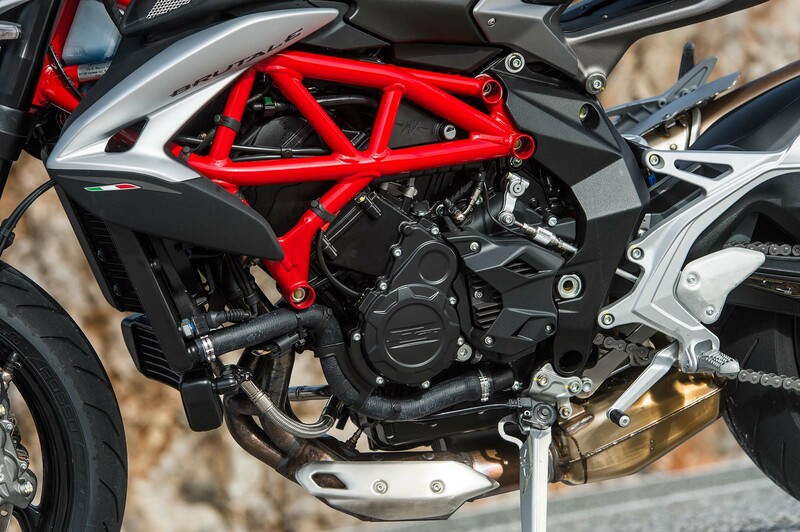 The Brutale 800’s six-speed gearbox is mated to a slipper clutch that is hydraulically actuated, the only bike to do so in its class – as MV Agusta is keen to point-out. 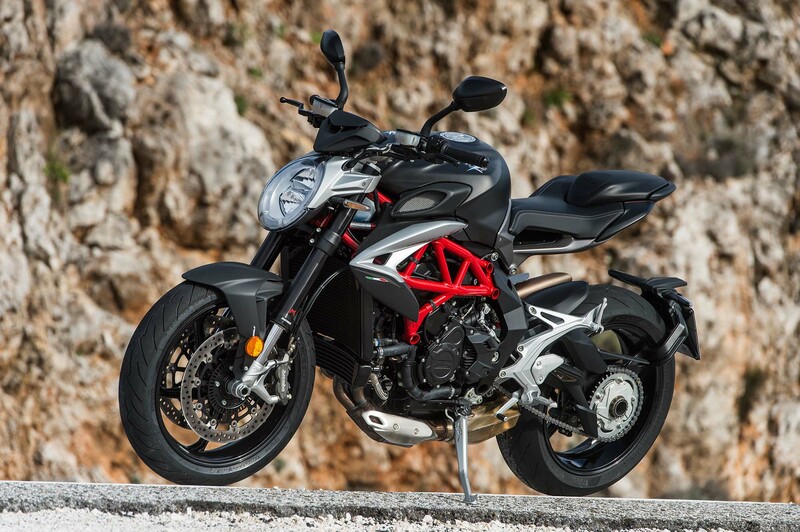 Another feature in this category that is exclusive to MV Agusta, the Brutale 800 is also fitted with MV Agusta’s EAS 2.0 quickshifter, which auto-blips and rev-matches; and more importantly, it handles quickshifts both up and down the gearbox. The EAS 2.0 system has been greatly improved for 2016, and makes the clutch lever almost unnecessary to the ride the Brutale 800. The only fault we can give the EAS, and the gearbox in general, were the several false-neutrals we encountered, primarily while downshifting. We wouldn’t call the quickshifter issue critical, though we wouldn’t call the Brutale 800 gearbox dead-to-rights reliable either. 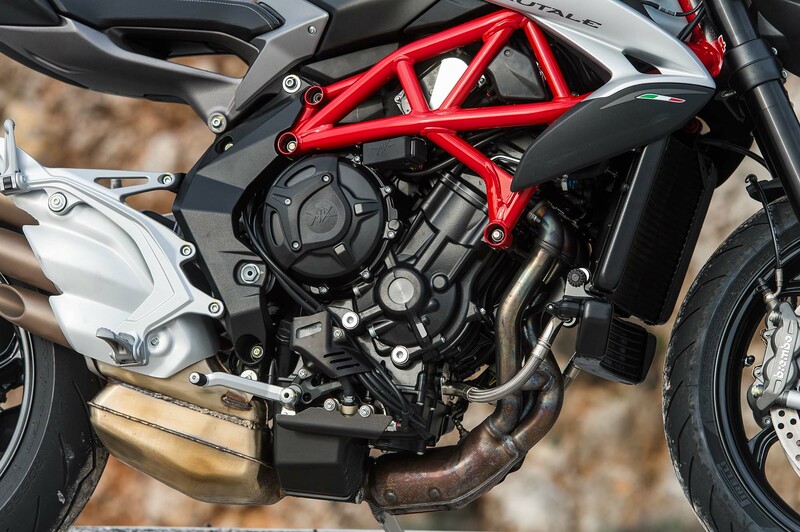 While the engine of the 2016 MV Agusta Brutale 800 is perhaps the most surprising element on the machine, especially if you were like us, as we were lamenting the spec-sheet upon its debut at EICMA. 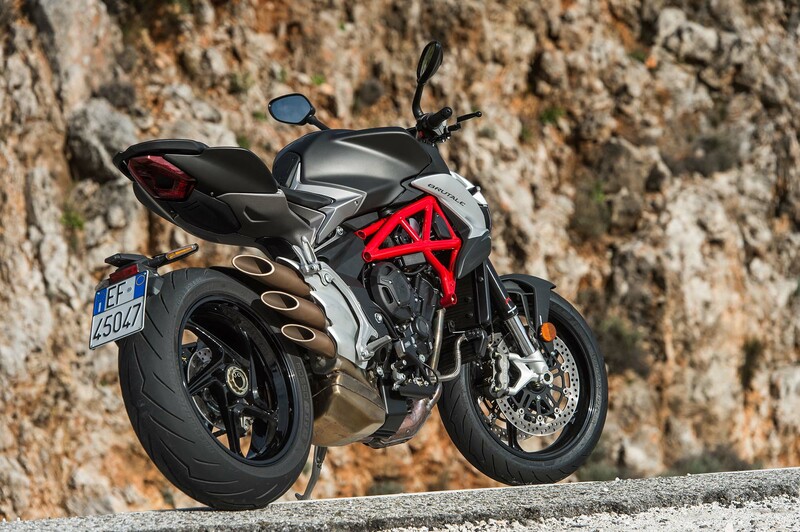 However, it is the chassis of the new Brutale 800 that wins us over. 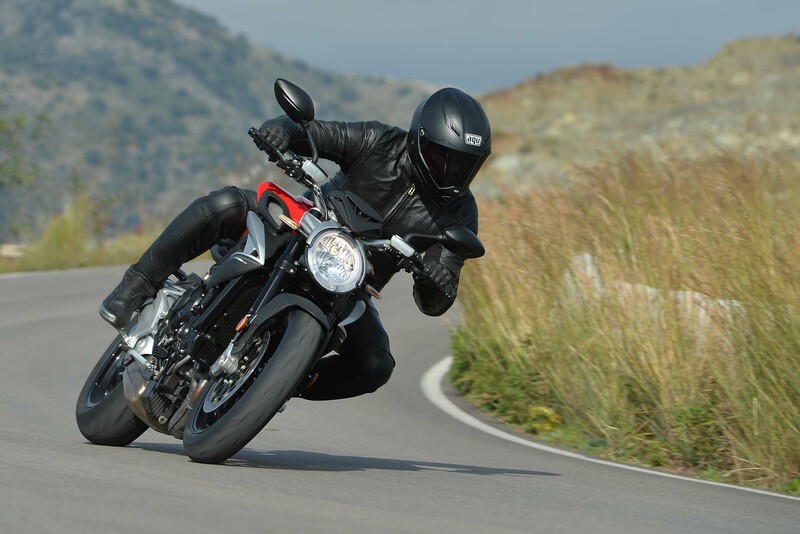 That shouldn’t really surprise those familiar with the newer Brutale models, as the chassis has always been highly regarded by testers and riders alike. As expected, the latest edition is no different. MV Agusta has made several subtle changes to its roadster for 2016, namely a revised steering head angle, which accompanies more trail on the front wheel. The affect is a motorcycle that absorbs and handles uncertain road conditions with a much higher degree of aplomb. The trade-off comes with a reduction in turning response, though we doubt most riders would notice the deficit as it is fairly subtle. 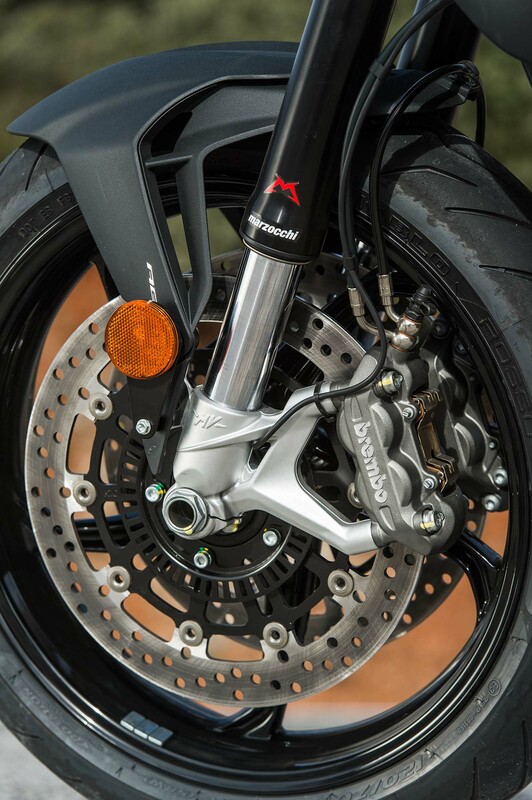 Fitted with Marzocchi forks and a Sachs rear shock, the suspension on the 2016 MV Agusta Brutale 800 is fully adjustable. Our bike was set up with settings that seemed to favor heavier riders, who like a moderately stiff ride from their motorcycle. We imagine those who fit a more “Italian” body size will find the ride fairly stiff, and will want to adjust the preload to their preference. Hitting several of the harsh road transitions on the way to Rondo, it is evident that MV Agusta made the right choice in this trial of compromises on the chassis geometry, especially in the headstock. Every time when the chassis and suspension were tested, the Brutale 800 held its line and soaked up what the road threw at it. The suspension was stable, and without any obvious pumping actions. Equally important, the front wheel didn’t seem susceptible to being coaxed out of line. Out of the box, the 2016 MV Agusta should be well-suited for “Made in America” riders, but thankfully MV Agusta has left the ample opportunity on the table to adjust the Brutale 800 to one’s own preference. It’s refreshing to see a manufacturer that understands adjustable suspension should be standard on all motorcycles made in the 21st century. It’s perhaps wrong to leave the electronics of the 2016 MV Agusta Brutale 800 buried so deep into this review. As we have stated already, the weak points of the MV Agusta line, especially its three-cylinder machines, hasn’t been their engines and chassis, it has been in the electronics. The average rider perhaps does not realize 1) how revolutionary ride-by-wire throttle control is to the motorcycle industry, and thus 2) how crucial it is for a motorcycle manufacturer to get this part of the machine right, out of the box. To this end, MV Agusta has made huge strides in developing its electronics package for its lineup, and the evidence in that progress has been the marked increase in the rideability and enjoyment that each successive model has brought to the table. With the MV Agusta Turismo Veloce, the Italian manufacturer for the first time presented a model that seemed fully baked from the factory. We were deeply impressed with the adventure-sport machine when we rode it in France last year, and though it wasn’t a faultless machine (very few are) it was a model that MV Agusta could be proud of from a technical perspective. The 2016 MV Agusta Brutale 800 picks up where the Turismo Veloce left off, and instead of a model that merely meets expectations, of our incredibly high standard, MV Agusta has introduced a machine with an electronics package that should cause other manufacturers to stop and take note. Since last year’s models, MV Agusta has continued to refine its proprietary ride-by-wire (RbW) system, and the development is starting to pay-off. Packaged into the MVICS 2.0 electronics suite, MV Agusta’s ride-by-wire provides immediate and precise throttle inputs for the rider. The effect is a subtle one, and best tested with fine throttle twists, but it is gravely important to the overall user experience. We cannot overstate the importance of well-executed UX design, and the understanding that this is what separates great brands from merely good ones. For the average motorcyclists, this translates into a ride-by-wire system that does not suffer from the laggy and wandering throttle effects found on lesser systems, of which there are many. It is commonplace now to see bikes that offer selectable riding modes, a feat made possible by the advent of RbW, though the execution of that feature can vary. 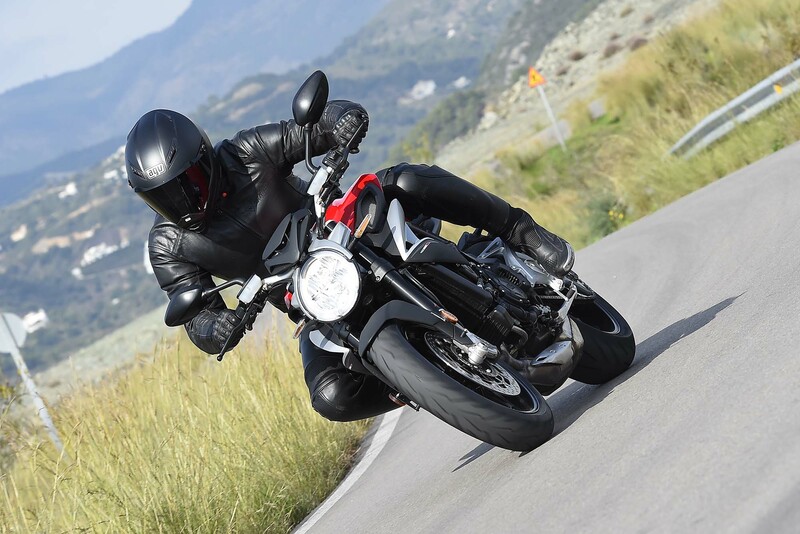 On the 2016 MV Agusta Brutale 800, riders are offered four riding modes: Sport, Normal, Rain, and Custom. Generally speaking, we would prefer the “Sport” mode on a motorcycle, as it usually offers the most power and the most crisp throttle response. It’s easy for a “crisp” throttle to easily become a “snatchy” throttle though, one that exacerbates chain lash, and causes the bike to lurch, even with small throttle inputs. For example, the Brammo Empulse R, now called the Victory Empulse TT, is perhaps the best example of a throttle response that is too quick for its own good. On the Brutale 800 though, the “Sport” mode is a true sport mode. It is the riding mode you would select when truly riding at a license-revoking pace, whereas the “Normal” mode is likely where most sport enthusiasts will want to reside. Dulling the throttle response ever so lightly, “Normal” mode is the sweet spot on the Brutale 800’s engine map offerings, and leaves plenty on the table for spirited riding, while not punching the bike with sudden throttle applications. MV Agusta has updated its quickshifter algorythm for 2016, and it shows. 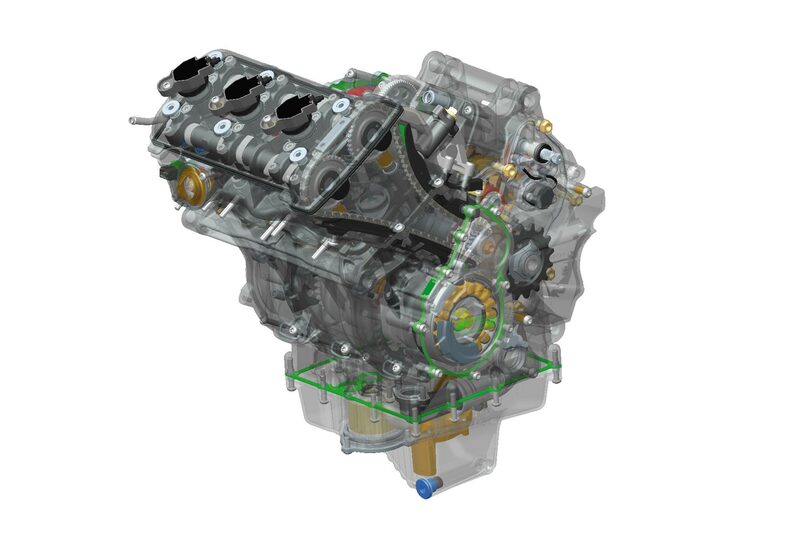 As we have mentioned, the EAS 2.0 quickshifter system offers quick-shifts both up and down the gearbox. Though we encountered some false-neutrals from the transmission, overall the EAS 2.0 is a very impressive feature. While hard on the gas, one can effortlessly upshift, often rewarded with a pop from the exhaust as the ignition is cut. Mashing down the gearbox is simple too, though has to be done with the throttle fully closed. Both directions offer quick and effective shifts, with each gear selected with ease. 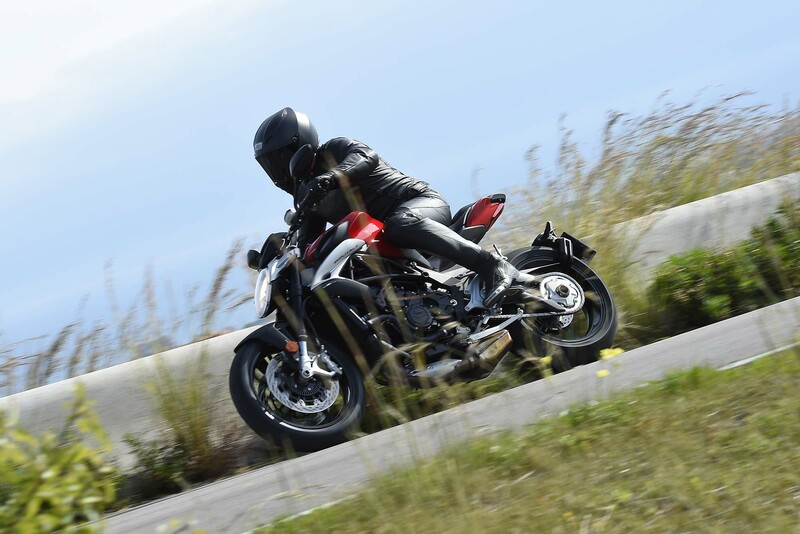 Unlike other quickshifters on the market, MV Agusta’s doesn’t mind slow speed use – in fact, it was quite hard to trip-up the revised EAS 2.0 package. The bottomline: This is easily the best quickshifter on the market, in any segment. Again, other manufacturers should take note. 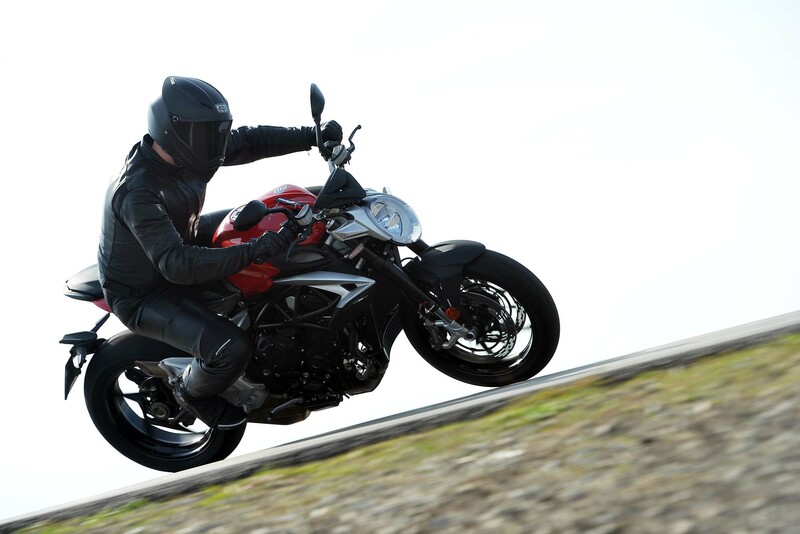 As for the traction control, our time on the MV Agusta Brutale 800 didn’t lend itself to too much testing. A few patches of gravel let us experience the rear wheel breaking loose, and brapping the throttle proved that if you power-wheelie to quickly, the TC will tell you that you’ve been a naughty boy, and lower the front wheel for you. Similarly, we did not have much time to test the ABS brakes, though the Nissin master cylinder and Brembo calipers worked exceedingly well. 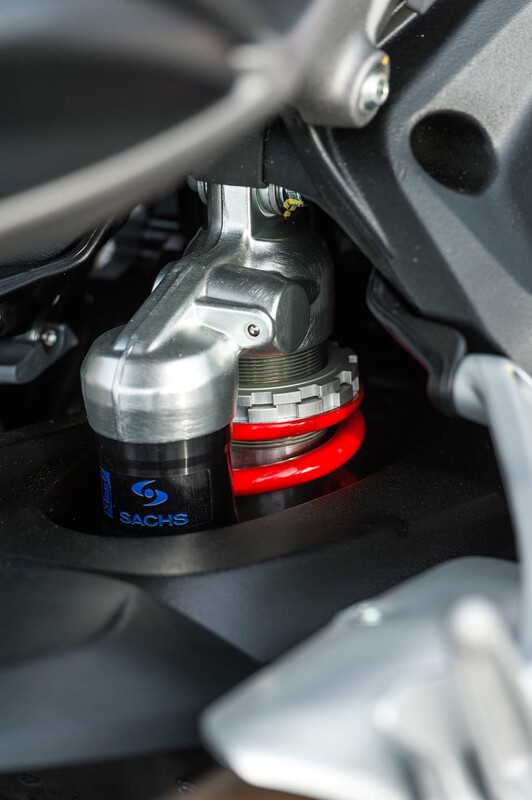 Since MV Agusta uses the same Bosch 9+ ABS unit that we’ve seen on many other models, we would expect good things from the small and reliable package. You cannot switch off the rear-wheel ABS, and leave the front ABS on – a feature we wouldn’t mind having for hooning around. However, the entire ABS package can be switched off, if that’s your cup of tea. As expected, the overall fit and finish of the Brutale 800 is quite good, thanks to MV Agusta’s attention to detail concerning the design and materials of their machines. Unfortunately, not quite as much consideration was given to the rider position on the Brutale 800. The seat is stiff – hard like a board, really. Surprisingly, I didn’t have any issues with my luscious booty while on our 150km jaunt, though with our many stops and relatively short distance travelled, that doesn’t really surprise me. If you are more sensitive in the rump region, you are probably going to be looking for alternatives to what MV Agusta is offering on a stock machine. 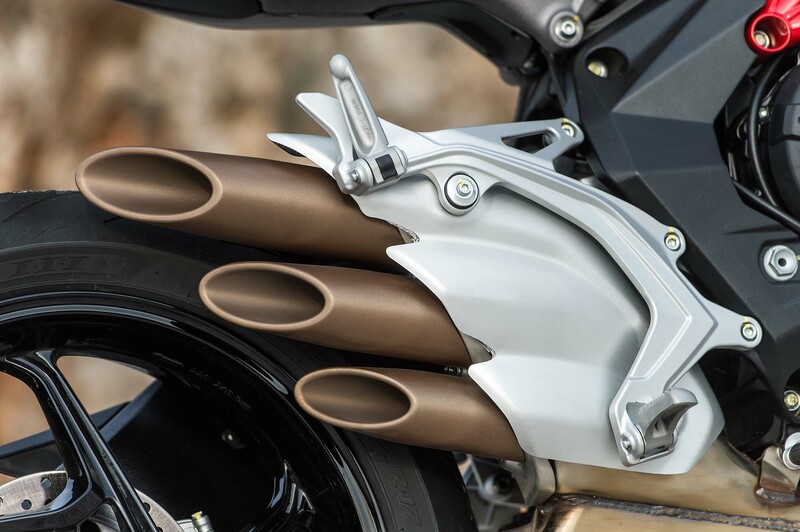 Of bigger issue is the rearset on the right-hand side of the Brutale 800, which has a compromised heal clearance due to the three-pipe exhaust system. Riders like myself, who ride on the balls of their feet and hook the bike with the inside of their heal, will find their efforts impeded by the heat shield for the exhaust can. The affect doesn’t rise to the torture-rack levels of the Ducati Streetfighter 1098, but even after our short sessions through the mountains, my knee was feeling the effects of having to be the joint that gives while leaned over. 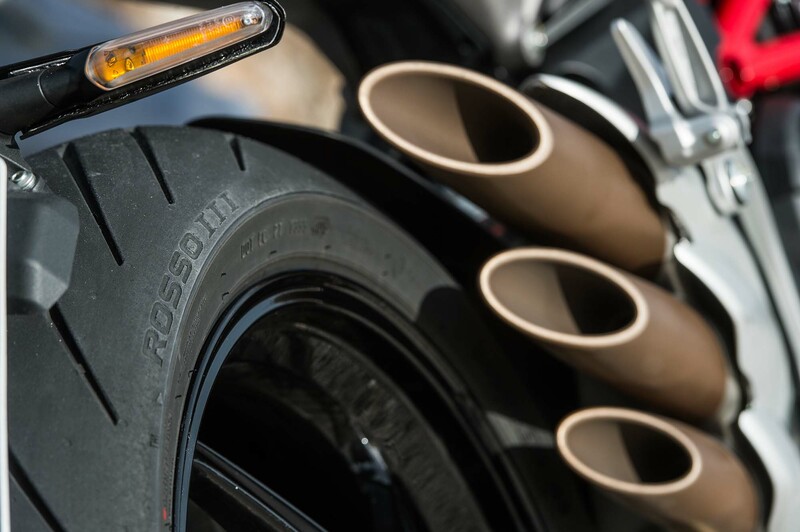 Rearsets and a different exhaust seem to cure the issue fairly well, though we imagine more frugal riders could get by with finding a way to lengthen the foot peg. Despite the issues with the right foot, the rest of the rider triangle is quite good, and makes for a comfortable ride. The leg-length is more stretched-out than the your typical middleweight sport bike, and even my 6’2” frame found the legroom to be very palpable. Similarly, the handlebar reach leaves the body fairly upright, with good spacing on the distance between your hands. 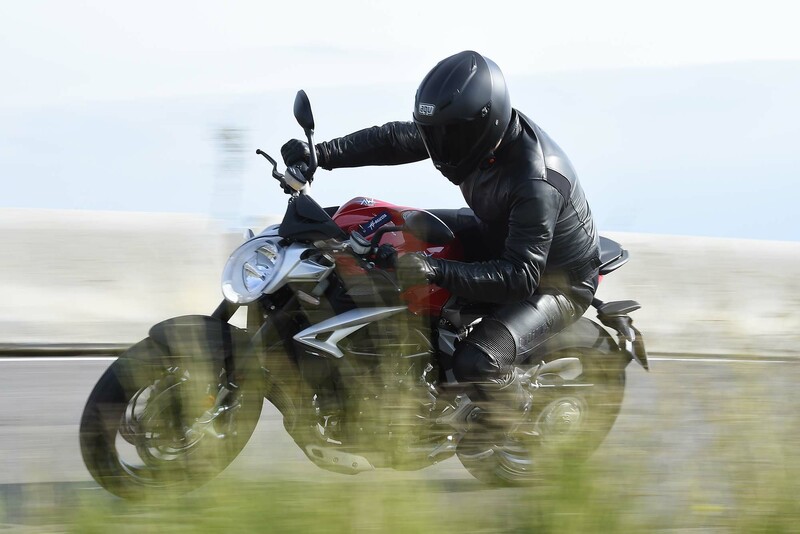 MV Agusta didn’t intend for long-distance rides on the Brutale 800 (that’s what the Turismo Veloce is for, after all), though we could see the new Brutale 800 handling the miles quite well. 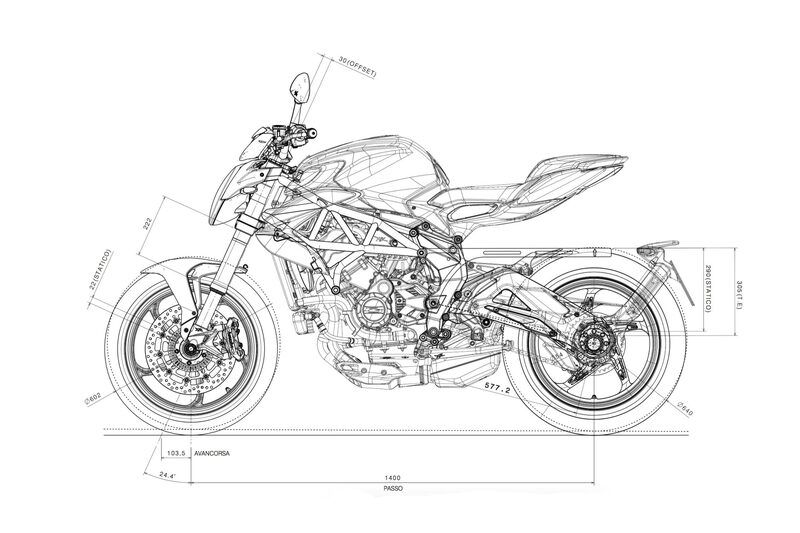 While your arms and legs might thank the MV Agusta design team, your hands will not. 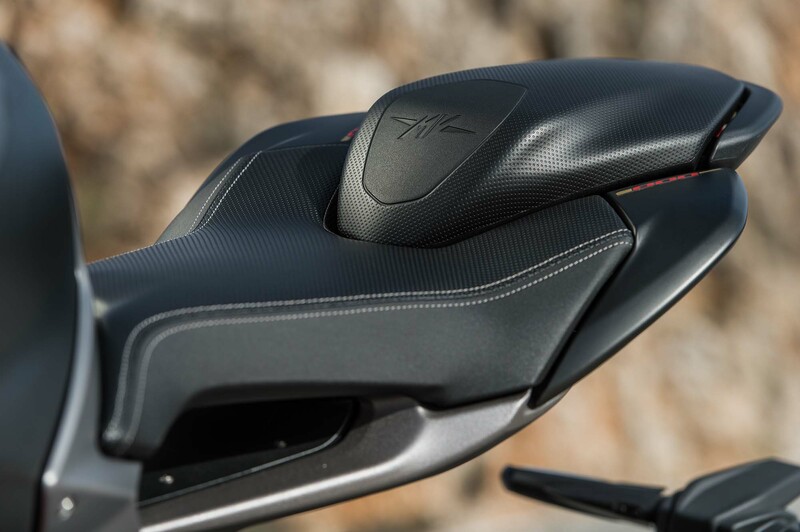 MV Agusta continues to use the most confusing control clusters on the market, and more than one journalist was caught “honking” their turn signals. 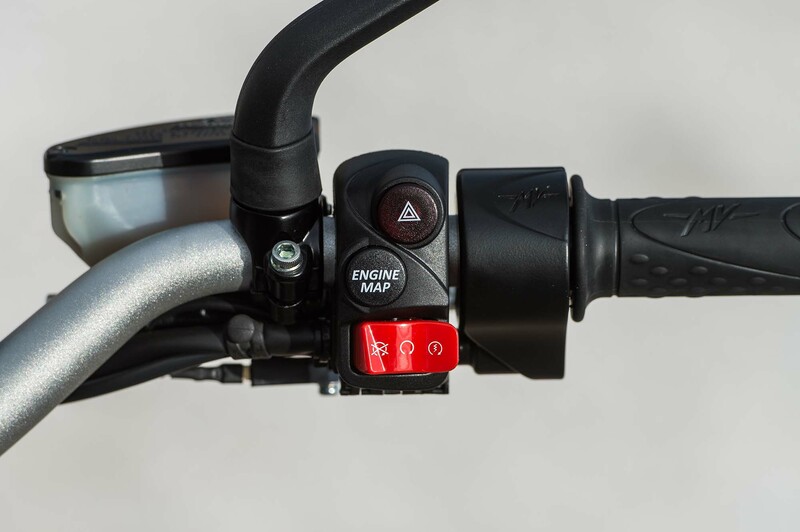 This is because on the left-hand control cluster, MV Agusta continues to put the horn button where the turn signal switch is on almost every other motorcycle, and vice versa. 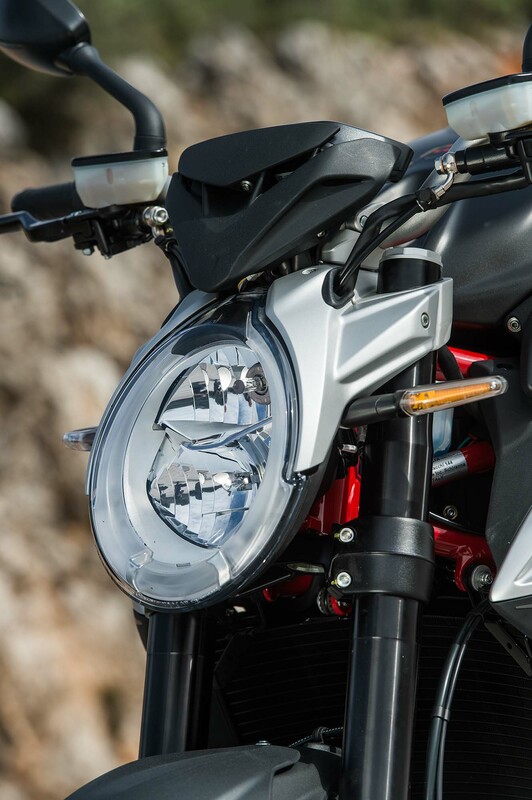 Additionally, the headlight beam selector could easily be confused for a kill switch, with its red button – another common and confusing feature of MV Agusta’s three-cylinder lineup. On the right-hand control cluster, the issue stems from the distance that the throttle map selector button is located from the throttle. 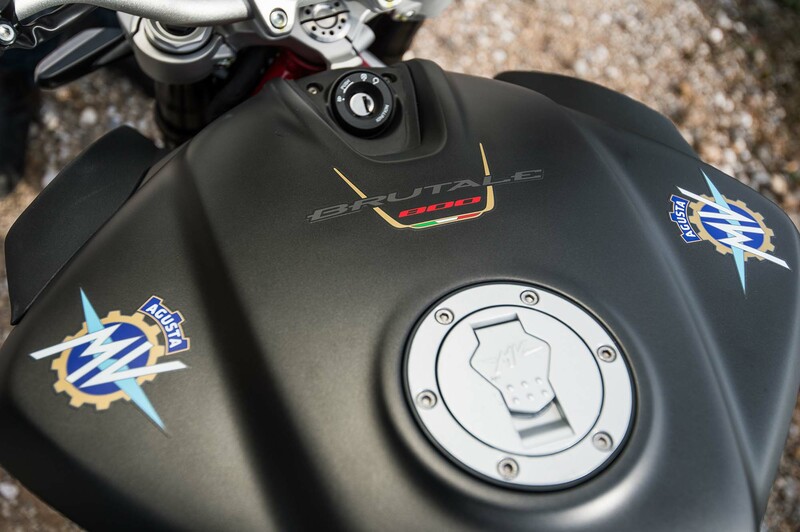 While the MV Agusta Brutale 800 can have its riding mode changed at virtually any point in a ride, the button placement makes it difficult to achieve this in virtually any condition except a dead stop. Most OEMs place the mode selector on the left hand side, as the clutch hand is usually more free to do tasks while riding and with less rider concentration involved. MV Agusta should take note of both these issues and make a more integrated solution, rather dipping into the common parts bin for answers. This thought should also include the traction control and ABS setting selectors, whose switchgear is on the left-hand side of the handlebar, and has never been an element we look forward to seeing on MV Agusta’s machines. Virtually every other motorcycle manufacturer has found a better way to integrate the many switches used to operate a modern motorcycle. It is perhaps time that MV Agusta look at what else is available in the marketplace (the switchgear on the RSV4 would be our pick), and just copy what works best. 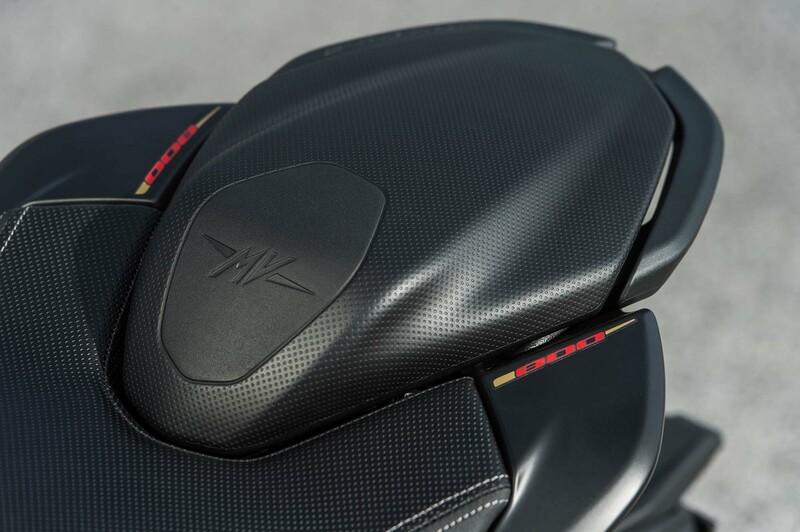 This isn’t a realm where we need to re-invent the wheel, and as electronics become increasingly important on modern bikes, especially in MV Agusta’s lineup, more attention needs to be given on how riders interact with them. 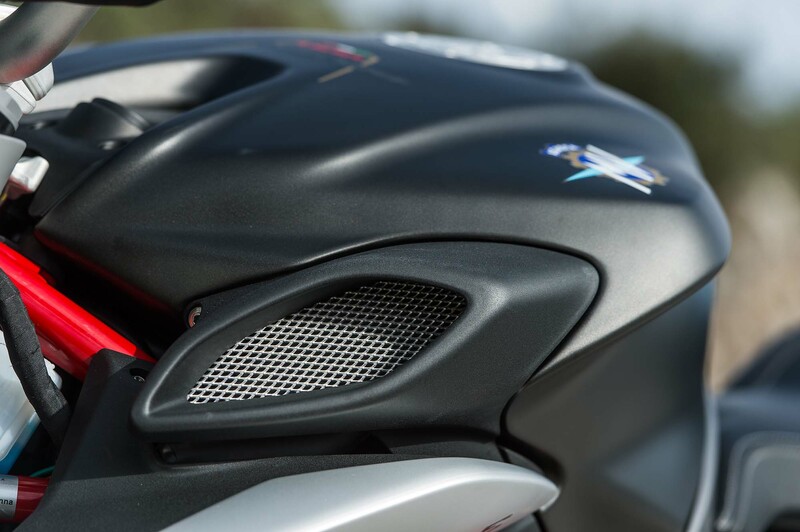 With that criticism in mind, we have to give credit to MV Agusta finally hearing our call for a better dash display. Not the robust TFT/OLED units we have seen other manufacturers use, but the folks in Varese have finally found a way to make their dashes readable to people with 20/20 vision. Both the tachometer and speedometer are now legible with a slight glance at speed, something that was not possible on the old design, and the layout is fairly intuitive. That being said, MV Agusta’s designers still seem set on using fonts smaller than 12pt or one-pixel wide, which makes reading the TC and ABS settings a bit tough while riding. Forget about trying to reading the clock, we didn’t realize it was even there until the end of the ride. As you can see, we expect that the 2016 MV Agusta Brutale 800 will compete against other premium models, which also happen to be exclusively from the European continent. 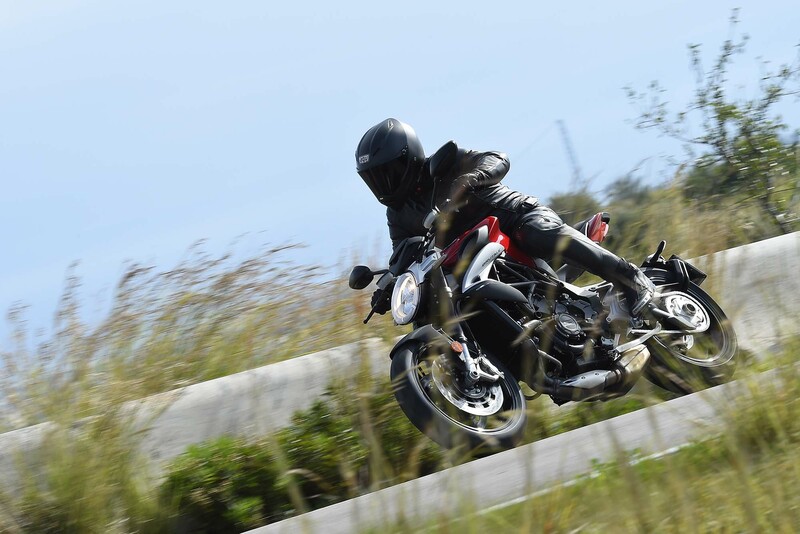 Purely spec-sheet racing, the Brutale 800 doesn’t immediately discern itself from the others, though we can say from having ample seat-time on the Ducati Monster 821, that the new Brutale 800 would easily be our pick between the two – mostly for the looks, but also for the added handling stability, greater ground clearance when leaned over, and power delivery from the three-cylinder engine. 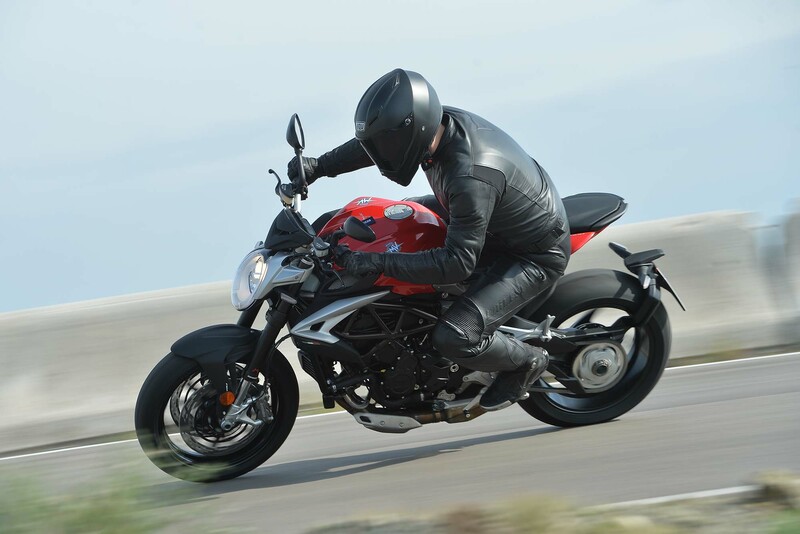 The Monster 821 is geared so short, it quickly runs out of steam; while the MV Agusta Brutale 800 seems to have more powder in its keg, when you are on the gas – an interesting critique, considering the 2016 model loses some of the top-end punch the 2015 model has. 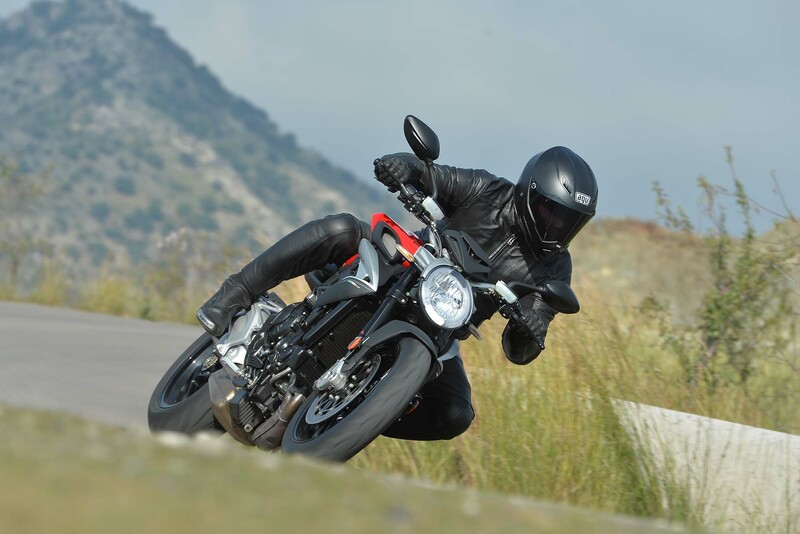 It is of note that both the Triumph Speed Triple S and KTM 690 Duke are revised machines for 2016, and unfortunately Asphalt & Rubber hasn’t had the opportunity to ride either of these bikes yet. Judging from their predecessors, the KTM is likely the winner in the smiles-per-dollar category, while the Triumph offers the most power for the dollar, though at the cost of being significantly heavier. Of course, the big change for the KTM 690 Duke in 2016 is its added refinement, namely a secondary balancing shaft, that has been added to the raw thumper for this year in the hopes of taming its nasty vibrations. The Triumph likely posses the extra power we wish the Brutale 800 had, and it gets that through its extra 250cc of displacement. 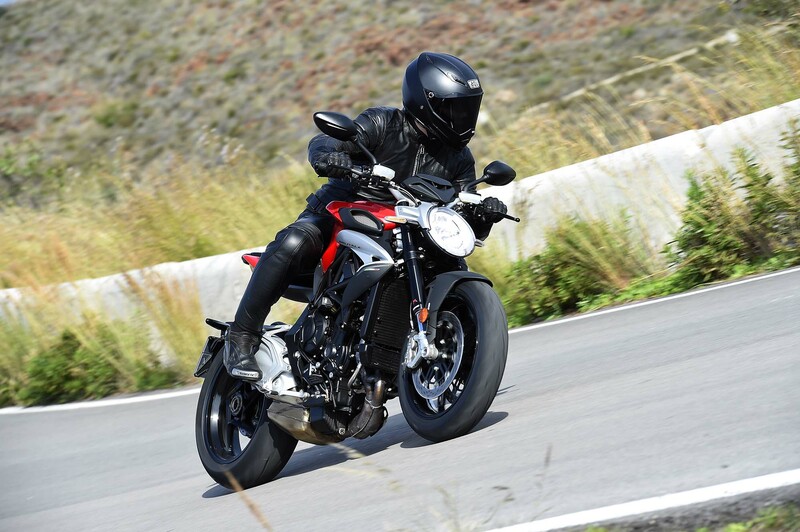 We’ve always enjoyed the Speed Triple, but at 423 lbs, the 2016 Triumph Speed Triple S is the obvious fat kid in the candy store. Ultimately, decisions will come to rider preference and priority. This is a tough market segment, with three of the four machines on the premium-end of the spectrum seeing revisions for 2016. It might be too early to say which one these four models would be our overall winner, but it should speak volumes that we had a very hard time calling it a day on the 2016 MV Agusta Brutale 800. If one finds itself into your garage, you should have no qualms about it, and you certainly won’t be disappointed.